"I kinda like the sight of blood... but this is disgusting!" Excess has come to define the 80s, particularly when it comes to horror movies: there were too many slashers, too many sequels, too much gore—too much of just about everything. In retrospect, it’s become sort of a charming feature of the era—we look back fondly at the extravagance because they’ve become codified as humorous, harmless signifiers of an era unwittingly consumed by consumption. Every now and then, however, you’ll come across a dispatch from the era that was well-aware of and criticized the malaise surrounding them—stuff like Day of the Dead and They Live especially come to mind. But there’s also the works of Larry Cohen, a filmmaker whose genre efforts were often laced with trenchant commentary—to put it in modern parlance, Cohen was “woke af,” and The Stuff is among his more obviously political efforts. Couched right in the heart of Reagan’s America in 1985, The Stuff takes aim at consumerism, the junk food industry, and conformity. It’s essentially Cohen’s riff on Invasion of the Body Snatchers and The Blob by way of the era’s preoccupation with goop, gore, and latex: somewhere down in the heart of Georgia, a group of miners poke around during a snowstorm when up from the ground comes some sort of bubbling crude. Naturally, one of the worker’s first instinct is to taste it, only to discover it’s a delicious substance forming naturally from the ground. Within months, it’s commoditized and sold in stores as “The Stuff,” an enormously popular great-tasting, no-calorie snack that becomes a national craze, complete with inescapable ads and jingles. At a loss as to what to do now that their own junk food has become disposable, a group of ice cream magnates tap corporate saboteur David “Mo” Rutherford (Michael Moriarty) to investigate and (hopefully) bring down the shadowy cabal behind The Stuff. Mo’s trek eventually has him crisscrossing the country, where he teams up with a ragtag assortment of accomplices, including the marketing director for The Stuff (Andrea Marcovvi), a deposed cookie baron named Chocolate Chip Charlie (Garrett Morris), and a young boy (Scott Bloom) who has run away from this Stuff-crazed family. The Stuff has a bit of a rambunctious, shaggy energy to it as a result—at times, it feels like a genuinely spooky pop people movie, at others, it’s more of a madcap conspiracy thriller where the gunshots result in goopy, yogurt-like discharges instead of blood squibs. Many of the bits involving the young kid sidekick give the film a dark Spielbergian vibe, which I suppose translates into a Joe Dante vibe. By treading the line between deadpan and knowingly eccentric, Moriarty captures whatever the hell it is Cohen is up to here. His main thesis is obvious and difficult to miss—the junk food industry and corporate America are not only slowly poisoning us but are also making us complicit in our own destruction. “Enough is never enough,” the jingle incessantly intones during the various advertisements that often intrude into the film as sarcastic piss-takes on the insidious, mind-worming effect of modern marketing (Cohen even goes so far as to include familiar faces, such as Clara Peller of “Where’s the Beef?” fame). We also watch the sinister mechanisms of backdoor corporate politics unfold as Mo and his oddball band uncover a conspiracy that manages to overtake entire small towns, where the populations are essentially reduced to zombies by a product that has gone untested. But again, Cohen hardly moves in a straight line with these criticisms, especially when he takes a hard turn during a third act that finds Mo seeking the help of a right-wing military zealot (Paul Sorvino) who fashions himself as a savior for a hypothetical apocalypse that suddenly looks much less hypothetical. It’s an odd turn of events, one that reveals Cohen’s searing cynicism since this group is so eager to give themselves over to an obvious maniac—it would seem that if the junk food industry doesn’t kill us, then the military-industrial complex will surely finish the job. Even our level-headed, supposedly clear-minded heroes are all too comfortable with essentially staging a military coup overseen by a Neo-McCarthyist. And this is not to mention the disturbing resolution and coda: the former sees both Mo and his kid sidekick consumed by vengeance, while the other suggests The Stuff will never truly be eliminated. What was once popular becomes contraband—or yet another target in the ridiculous war on drugs. Ultimately, The Stuff is a perfect title since the various threats in our lives are shapeless and nebulous, from shadowy conglomerates to bureaucratic red tape. Cohen’s aim is admittedly roughshod and scattershot, not to mention a bit too obvious, but the indelible mean streak underpinning the film reveals a nasty counterpoint to this era’s preoccupation with excess. 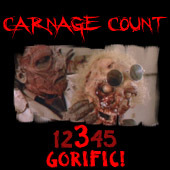 With admittedly limited resources (some of the compositing especially reveals some budgetary seams), Cohen directs that obsession into outrageous gore bits: heads are torn apart and bodies are turned inside out, visually leading the audience to the film’s most pertinent question: “are you eating it, or is it eating you?” Cohen’s answer might be practically underlined and highlighted throughout the film, but it’s no less wicked to witness. Fittingly, the end only comes with a post-credits bit: truly, enough isn’t enough, even after 87 minutes of stuffing one’s face with the most amusing 80s horror-consumerism parable this side of Halloween III. The Stuff recently made its high-definition debut courtesy of Arrow Video. The disc includes a collector’s booklet, an introduction and trailer commentary from Darren Lynn Bousman, and “Can’t Get Enough of The Stuff,” an hour-long retrospective featuring the cast and crew.